Being vegan is nothing new. The moral debate about whether or not we should be eating sentient animals has been engaging people for centuries. The ethical issue of how inhumanely many modern farms treat and transport animals added impetus a long time ago. Most recently, the environmental argument has placed veganism higher on the agenda once again. Along the way, the health argument has been confusing. 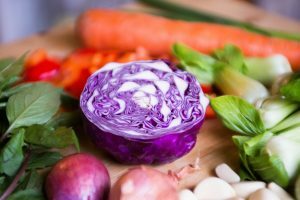 Is being vegan healthy or not? And does that even matter in light of the environmental, ethical and moral issues involved? Well, that last question is for you to decide. Hopefully I can help with the first: is being vegan a healthy option? I made a decision about 20 years ago to go from being vegetarian to being vegan. * It was an ethical choice, which, to begin with, largely meant swapping cheese on toast for peanut butter on toast, and veggie processed food for vegan processed food. It was not a healthy vegan diet. After serious illness and subsequent decision to study nutrition, I addressed the whole issue of how to be healthy and vegan. 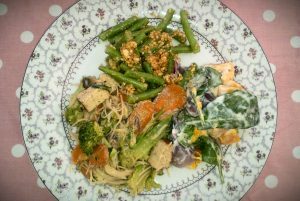 This meant cooking things from scratch, eating a much more balanced diet – and also including supplements to boost nutrients I wasn’t getting enough of. I don’t blame a poor vegetarian or vegan diet for my illness, but it may well have been one of several contributing factors. Plus if I wanted to stay healthy, then I felt I needed to take the whole business of self-nourishment much more seriously. And indeed, a 2013 Austrian study found evidence that vegetarians were twice as likely to suffer from depression and anxiety, 50% more likely to have allergies and at a 2% higher risk of cancer. Indeed, for every article or study that declares the vegan diet to be the healthiest, there seems to be another warning of potential health risks. So here are a few pointers I have learnt along the way. If you choose to be vegan, or to massively reduce your intake of animal produce, then I hope these 10 tips help you to do so in good health. not nearly as tasty as real, home cooked food. On a vegan diet, it’s harder to get the quantity and variety of proteins you need to make healthy cells, enzymes, hormones and antibodies for your immune system. Nuts, seeds, beans, peas and lentils all contain different kinds of protein (amino acids), but often in small amounts and usually of limited variety. 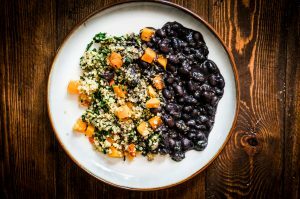 A food that contains all the essential amino acids in a useful ratio is called a complete protein – all animal sources are complete proteins, and so are soya beans (and so tofu and tempeh), quinoa and amaranth. Note, however, that quinoa’s protein content is about 14-15% .- so half that of chicken, for example. Tofu is only about 8% protein, so less than 1/3 that of chicken. To obtain all your essential amino acids from non-complete protein sources, you need to combine beans and other pulses with either nuts, seeds or grains (rice, oats, millet, barley or rye). So remember that on a vegan diet you need to eat higher quantities of your protein sources, and a greater variety. • 52.2g per day, or about 17.4g per meal. Eat a rainbow of vegetables. vegetables. It’s all too easy to go through the day with toast, porridge, sandwiches and maybe a couple of spoonfuls of veg at dinnertime – and this really won’t cut it. I often recommend at least 50% of each meal to be vegetables (not counting potatoes!). Vegetables provide the vitamins, minerals and phytonutrients you need to protect your DNA, skin, and organs, and as co-factors for energy production as well as enzyme, hormonal and immune system activity and so much more. Phytonutrients are also different coloured pigments, so aim for a rainbow of vegetables through your day or week. Green leafy vegetables are all superfoods packed with nutrients, so include these at least daily. Plus regular seaweed (sea vegetables) such as kombu, kelp and dulse will help provide the iodine and many other minerals you need for thyroid, brain and tissue health. Sunflower oil, olive oil, safflower oil, avocado oil and any oils with high levels of omega 3, 6 or 9 readiy form cancer-forming chemicals when you heat them. Coconut oil seems to be more stable (except at high temperatures). These oils also go rancid when exposed to oxygen, and more quickly in the presence of heat or light. So keep them cool and with the lid firmly on. In addition, most of the vegetable oils you can buy have been extracted and processed using chemicals such as hexane and caustic soda. So look out for cold- pressed /expeller-pressed oils for your dressings. Some vegan foods contain vitamin B12, but in a form most scientists agree is unable to be utilized by humans. You need B12 for red blood cells, energy production, detoxification processes, hormone balance and much more. Take a vegan EPA/DHA supplement. EPA and DHA are forms of omega 3 that are essential to anti-inflammatory processes – and inflammation underpins every chronic disease you can think of from cancer to depression, from asthma to heart disease. They are also required by your nerve cells, and in fact every cell in your body. You can convert the type of omega 3 oil you get in nuts and seeds to EPA and DHA, but very inefficiently, and so a vegan diet may not provide enough. Until recent years, you could only get EPA and DHA from fish oil, but now ways have been found to extract the tiny amounts of EPA and DHA found in marine algae, and condensing them into a capsule. Take additional good quality supplements. This is to make up for the fact that the soil is too depleted to provide optimum nutrition from diet alone. This is an issue not just for vegans but for everyone. The McCance and Widdowson studies as well as other research has highlighted the lack of minerals in modern soil. I believe this is largely due to intensive farming practices, including poor flood/rainwater management that means the topsoil is often washed away. Good quality means free from unnecessary fillers (including calcium carbonate), sweeteners, colours and flavourings. Plus using forms that are easier to absorb in combinations that help them to work better. For example, using magnesium citrate or magnesium sprays instead of magnesium oxide or carbonate. And taking iron as ferrous bisglycinate or fumarate instead of sulphate, and pairing it with vitamin C for better absorption. If you care about your health or the environment (and hopefully you are about both), then buy organic as much as you can afford to. Whether you are vegan or not. The pesticides and other chemicals used in non-organic farming are health hazards. They have been linked to cancer and other chronic illnesses. Many of them are hormone disruptors, which may affect fertility (in men and women) and menstrual health and cancers such as breast cancer. industry (I know honey isn’t vegan, but please bear with me!). 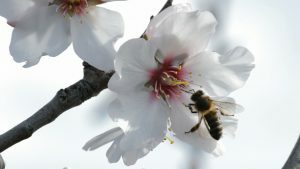 One beekeeper explained how bees were being killed by the pesticides sprayed onto almond trees – and that there were many more of these toxic almond trees since almond milk became more popular. I find the irony of this upsetting. I’m not saying don’t bother – I’m saying buy organic almond milk, or make your own from organic almonds (or other organic nuts, seeds or grains). If that’s too expensive, then buy organic anyway, but use less of it. While we’re on the subject, if you’re choosing veganism for environmental reasons, then buy more economical vehicles, use them as little as you can, and fly less. Films like “Cowspiracy” claim that going vegan will help the environment more than giving up cars, aeroplanes and other polluting forms of transport. These statistics have been hotly disputed, but whatever the final numbers, going vegan is not an excuse to ignore your air miles or petrol consumption. More a request than a tip: Please don’t preach. Or assume the moral high ground for being vegan, or shove upsetting images at people, via social media or elsewhere. For decades now, vegans have had a terrible reputation for this, and are often alienated as a result. Instead, lead by example. Share recipes and positive stories. Encourage and empower people rather than trying to bully, shock or shame them. Focus on what you can do yourself more than where to point fingers. The act of eating is for many already fraught with self-judgement, suppressed emotion and unseen stress, so let’s not add to that load. I do not claim to do all of this perfectly, all the time, and neither do I expect anyone else to. I do what I can, and assess from time to time where I can make improvements. I try to keep informed, and keep my mind open to new information and approaches. At the same time, I accept I can’t know, do or “fix” everything. So actually my 10th tip is simply do your best and keep an open mind. *While my ethics have changed little over the years, I am no longer vegan. I rarely eat meat, and am fussy about its provenance when I do. I am similarly particular about where any fish that I eat comes from. I want it to be sustainably sourced and caught, as low in heavy metals and other toxins as possible, and to have had the chance of as good a life and swim around as possible. My dairy and eggs (like my meat) come from animals that are not just “free range”, but organic and pasture fed, and my intake of these is also lower than most. I am grateful for every mouthful I consume, and my moral navigation of consuming animal produce is something I regularly reassess. I continue to educate myself on the pros and cons of being vegan, listen to my body’s needs as much as I can, and still cook delicious vegan meals many times a week.